The lower part of this panel depicts a hunt scene. There is a possible dog on the right, and it is facing a deer on the left. 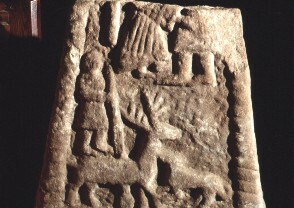 Above the deer there is a figure, facing right, holding a long staff.